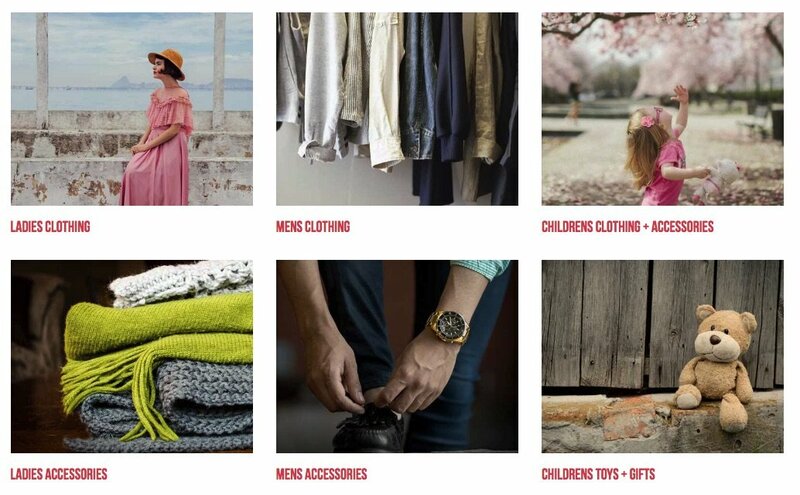 The Rare Brand Market has launched it’s Club for shoppers looking for something a little bit different…a directory of exciting products often not found on the high street and membership is free! 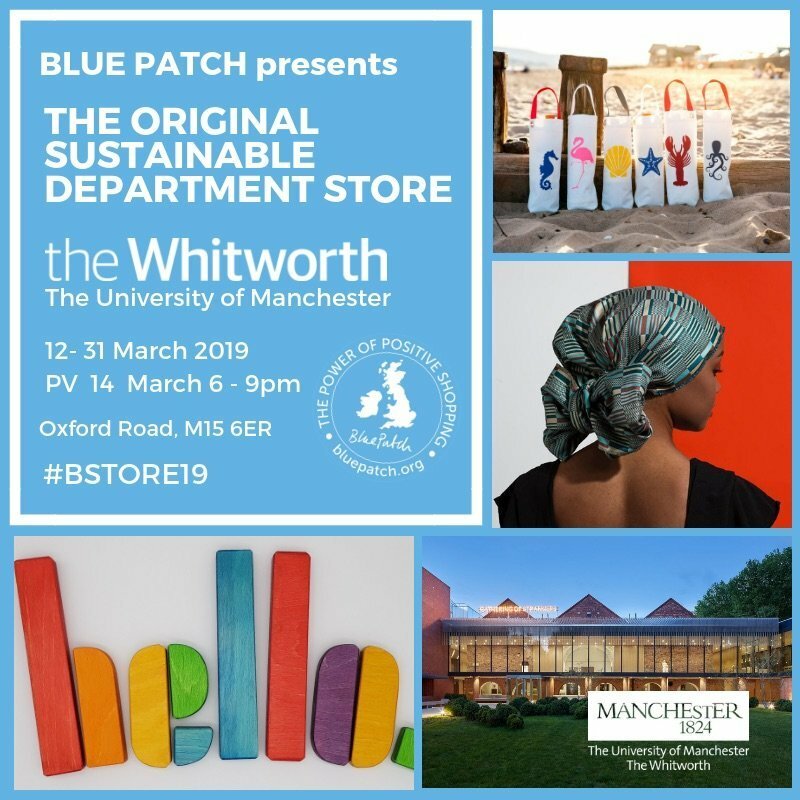 Blue Patch’s ‘travelling’ Sustainable Department Store pops up at the Whitworth, The University of Manchester’s acclaimed art gallery on the 12th to the 31st March 2019. The first regional museum to host the store – marking the launching Blue Patch’s grand tour of the British Isles….and Sails and Canvas are among the exhibitors! Visitors to one of Manchester’s finest galleries are in for a treat as national social enterprise Blue Patch, who represent over 400 of the country’s sustainable designers, crafters and manufacturers, are installing a radically refreshing retail experience: a ‘travelling’ Sustainable Department Store. 30 members of the Blue Patch Collective will showcase high-quality products, these include Eco Stardust’s plant based, biodegradable face glitter, the ‘must have’ for festival season, Circular Economy startup Bundlee, a baby clothing hire service launched by The University of Manchester trained entrepreneur Eve Kekeh. There will be ‘word search’ organic tee-shirts by Identity Papers and Manchester’s celebrated quilter and textile designer Lisa Watson will also be exhibiting. 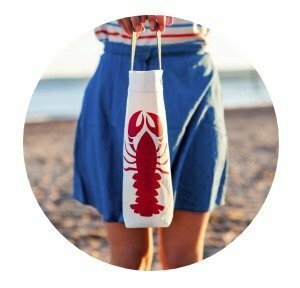 For a little pampering, there’ll be palm oil free, organic beauty and handmade perfume in refillable bottles and of course Sails and Canvas will have a collection of our lovely recycled sailcloth products. Blue Patch’s travelling store has a mission to help tackle two issues, climate change and the economy. Firstly, carbon-saving ideas shared within a desirable setting could encourage even more people towards behaviour change, helping to amplify the good things already happening. Secondly, the social disconnect caused by online shopping, rising business costs and brexit is cascading through high streets and local businesses are under extreme pressure. Tackling these issues head on, Blue Patch’s aim is to create high profile opportunities for their collective of SMEs and get them directly to local shoppers, increasing their chance of a stable customer base and finding other retailers to work with. More and more shoppers are demanding stores and manufacturers that are conscious of how and where they make their products. Shopping ethically in the UK has surged with a market value of £81.3bn (Ethical Consumer Markets report 2017). According to Ethical Consumer this is a growth of £40bn since 2008 and it’s the younger generation who are leading the trend. A YouGov survey demonstrated that almost a quarter 24% or respondents said they had bought products in 2017 specifically because of their ethical reputation. The store will provide all you could wish for in terms of unique designer-makers, so if you are in the area, why not pop in and browse the best in UK design. 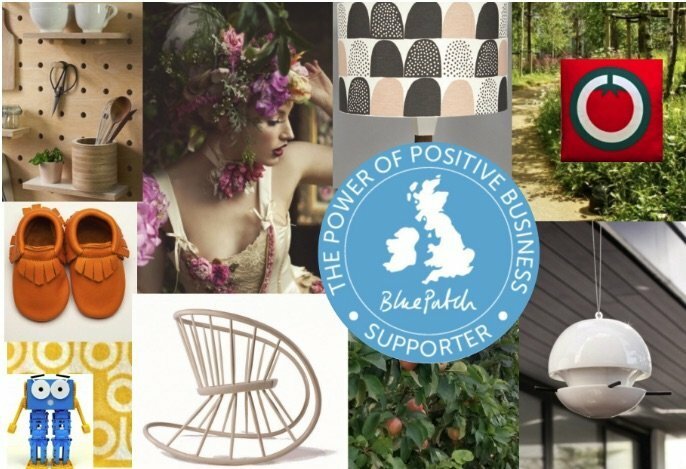 We have just been invited to join Blue Patch, a sustainable marketplace for UK design, ethical fashion, eco-furniture, green gifts, organic & fair trade food fine things – all made in the British Isles. We are very excited about our latest commission work for Daymark 1683 Dark Rum. Distilling now on St Martins, Isles of Scilly and launching early summer! Let’s hope the sun is shining when the bottles are ready to set sail! We were delighted to be mentioned in ”featured products” @naturalmummamag. November issue. 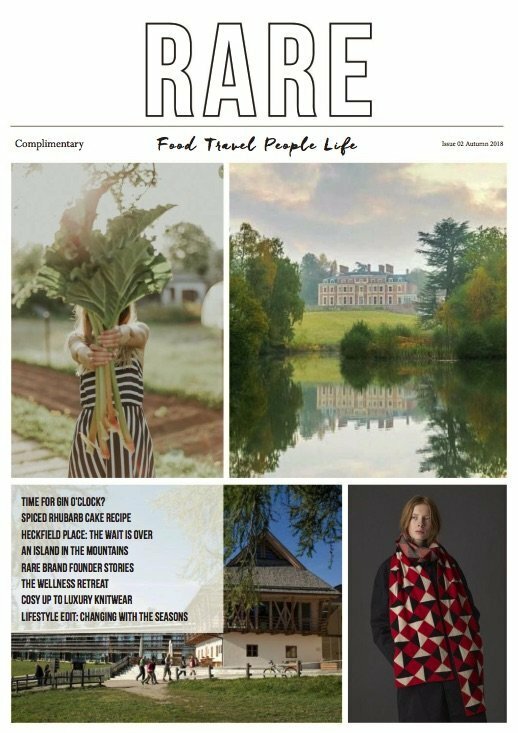 A great magazine featuring slow ethical fashion, sustainable brands , conscious lifestyle and wellbeing. Reclaim, Rethink! In February the National Maritime Museum Greenwich got in touch…They had several vintage sails which were being removed from their exhibitions and rather than dispose of the sails they had the idea of recycling them…enter Sails and Canvas! The result is a limited edition of these beautiful cotton sailcloth wash bags & duffle bags which are now available to purchase at the NMM gift shop. Rare Brand Market – the 2nd E-magazine is now available..enjoy!! Perini Navi specialises in the design and construction of superyachts, both motor & sail, in aluminium and steel and have more than 55 per cent of the world market for sailing yachts over 45m in length. The Perini Navi Cup is an exhilarating event reserved for Perini Navi yachts that combines high-performance sailing with the Mediterranean lifestyle in a relaxed and friendly atmosphere. Now in its 7th edition, this formula has proved hugely popular with owners and captured the imagination of the yachting world. 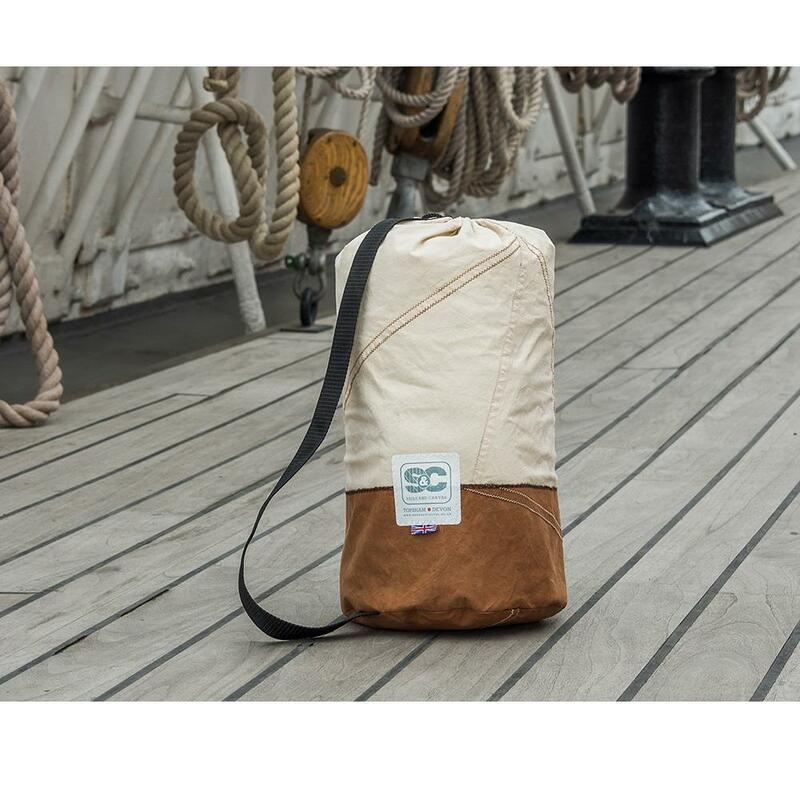 The crew of one superyacht “Aquarius” will be gifted an exclusive personalised upcycled sailcloth flight bag…I wonder which Devon based eco-conscious company hand made these?! 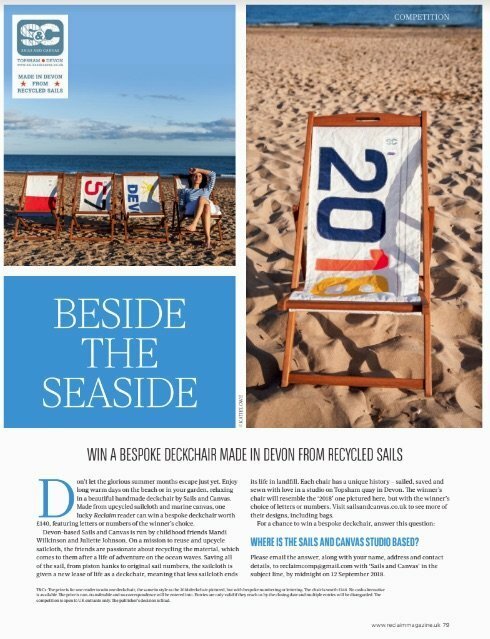 Having featured in an early summer issue of the gorgeous Reclaim magazine we are delighted to be part of this month’s magazine competition, offering one lucky Reclaim reader the chance to win one of our bespoke deckchairs…Issue 30 is in the shops now!